Diya played a beautifully straight forward defensive shot to Finchley's star player on the first ball of the game, called "yes", and our openers trotted through to their first single. Maisie did the same to the second. We were on a roll. We started beautifully, and we never let up. We had beaten Finchley all ends up last time we played, so when Amani won the toss, she decided to bat so that we could have a bit more time playing on this occasion. 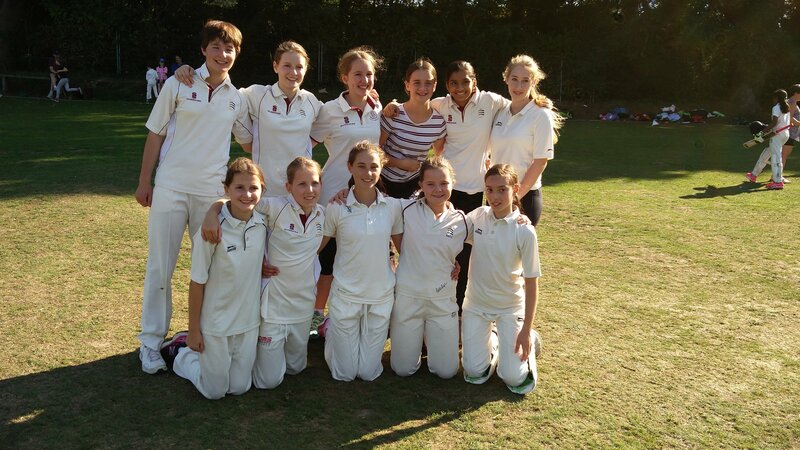 We were missing a few key players, but Finchley wanted to make it a only nine person game, and Jess Plimley and Elinor Chadwick stepped up from the u11s. Finchley have one astonishing player, a few decent ones, and then a few who are really finding their way in the game. Finchley's astonishing player is called Hannah. She is the captain, she opened the bowling, and batted number three. She brought up her maiden 50 against us with a six, and made 70-odd per cent. of their runs. By contrast, North Middlesex are a genuine team. This match report is now going to celebrate the achievements of every one of our players, all of whom contributed marvellously. Diya: has become one of our regular opening batters, scoring freely off good bowling. She also bowled her left arm seamers very economically and fielded magnificently - including executing a fabulously nonchalant run-out. Maisie: our top-scorer, with 17. I am so pleased for Maisie, who has only started playing cricket this year. She sees the ball very clearly, and eases away shots to virtually every ball. She has also begun to judge a run very well. Elinor: stepped-up from the u11s to play for us (against a hard ball for the first time) at the very last minute. She batted at number three and looked completely at ease with the situation. In fact, the only reason she didn't get a 50 was because she had to leave early to go to a swimming lesson! Lakeesha: not out at the end of our innings, with fewer runs than I had expected, but she makes so much happen when she is at the wicket through her decisive running. However, Lakeesha's real glory today was with the ball, destroying the Finchley middle order. Amani: scored very quickly, to take us up to an intimidating 128 for two. We had agreed that we would aim to get 100, so to get this far in excess of what we had hoped was a fantastic collective achievement. Finchley's Hannah brought up her 50 with a six off Amani. Amani's response was to bowl Hannah next ball. Emilie: opened the bowling absolutely beautifully, trapping one of their openers for the plum-est LBW I have ever seen (by the way, I understand there was some consternation amongst the Finchley parents that I gave LBWs - the league rules definitively provide for this). It is a shame we have not seen more of Emilie this year, because she contributes so much to our game. Anna: bowled two maidens, including a wicket maiden. Anna bowls accurately, consistently and to her field. Everyone in the team should try and think about their game as clearly as Anna does. Jess: the u11 captain and wicket-keeper made her keeping debut for us today, and did so very well. u13 level is a real step up for a keeper, with a hard ball and faster bowlers - and bear in mind North Middlesex have more fast bowlers than most teams. Jess did a phenomenal job and learnt a huge amount. Jasmine: last week's top scorer did not get a bat this week. But she responded by opening the bowling magnificently. The statistics for the season are establishing a pattern now. They are on this website. Jasmine is proving to be a wonderfully economical and threatening bowler. OK, she didn't get a wicket today, but every ball she bowled challenged the batters. North Middlesex Cricket Club won the toss and decided to bat.